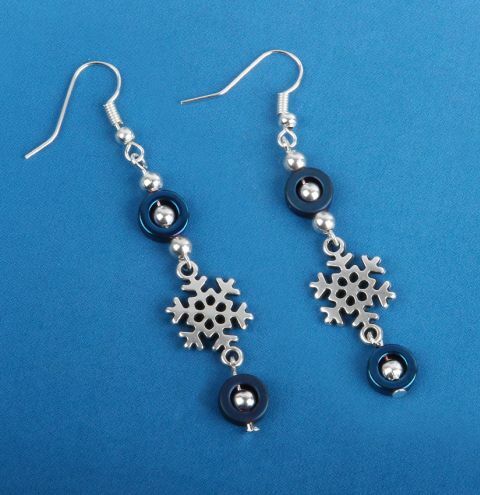 Make a shiny pair of snowflake earrings for Christmas with NEW hematite gemstone beads! Thread a silver bead onto an eyepin and then a hematite bead (with a silver one inside) followed by another silver bead. Use your pliers to bend the end of the headpin to a 90-degree angle and trim away to leave a post of approx. 1cm. Use your round nose pliers to make a loop. Attach one of the loops to one side of the snowflake connector. Attach the other end to an ear wire. Next, thread a hematite bead with a silver bead inside onto a head pin and make a loop like before. Attach this to the bottom of the snowflake charm. Repeat these steps to make your second earring.